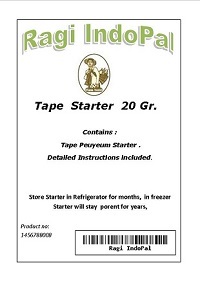 1 Package contains 20 Gr. Peuyeum Starter. 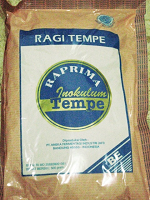 Tape Telor is similar to Tape Ketan, although,Ppeuyeum is prepared with Cassava root instead of glutinous rice. The term telor actually means egg or white, and for some reason the term is also used for tape in certain parts of Indonesia. This is possibly in the sense that the tape is white in reference to good quality of the fermented cassava. In Bandung, West Java, tape cultured with cassava root is known as Peuyeum Peuyeum, sometimes referred to asnda or Sundanese. In west Java, Peuyeum Bandung is a popular term used for this particular culture-product. 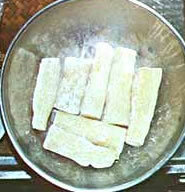 Peuyeum is prepared with fresh young Cassava roots, which are initially cooked by boiling in water until tender. The roots are cooled then inoculated by sprinkling ragi sprinkled evenly over the surface of the cooked vegetable root. The inoculated roots are placed in wooden baskets and arranged in a crisscross fashion, filling the basket about 3/4 full. The basket is covered with a wooden lid and the contents are left for a few days to ferment at room temp [about 30 C]. This produces a very delicate textured sweet tasting product, which explodes in the mouth with each bite, releasing essence of a sweet delicate taste with spirit of alcohol [produced during fermentation]. The original creamy-starchy texture typical of cassava root, is transformed into a very interesting texture, which melts in the mouth. Once eaten one cannot seem to get enough. Portions of undigested fiber of cassava root not affected by the fermentation process, is what gives peuyeum a delicate-spongy texture and consistency [a unique mouth feel]. The best quality peuyeum is prepared with tender young cassava root. include detailed instructions how to make Tape Telor.